Home Town Leave Travel Concession applicable for the year 2014-2015 can be either utilised as Home Town LTC or as All India LTC on or before 31st December 2016. Have you planned for any Home Town Trip or Leave Travel by availing LTC and Encashment of Leave on LTC before this year expires ? Then Carry over provision available under Rule 10 of LTC Rules would be very handy to you. Rule 10 of LTC provides that A Government servant who is unable to avail of the leave travel concession within a particular block of two years or four years may avail of the same within the first year of the next block of two years or four years. 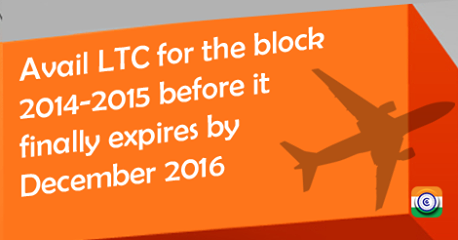 The Current 4 year LTC Block is 2014-2017 and Two Year Block Year is 2016-2017. However, the home town LTC applicable for the Two year block year of 2014-2015, can be carried over and utilised by Central Government Employees either as home town LTC or as All India before it finally expires on 31st December 2016. By Carrying Over of LTC for the block year 2014-2015, employees who intend to travel on LTC before 31st December 2016, can avail one more Home Town LTC or All India LTC (if they have converted the home town LTC to All India LTC in the previous 2 year block) before December 2017.